I dislike labels, particularly political labels. Their primary purpose is to categorize "others" in order for you and I to then apply a down and dirty cognitive shorthand, determining in effect if the "other" is one of "us" or one of "them". The only people who "win" when this type of thinking is applied are those who promote, and benefit from, a divide and conquer/control strategy. As I've stated before, rarely have I found anyone who identifies as fully belonging to one ideological group or another. In America we are presented with two major ideological/political choices, Democrat or Republican, along with a host of minor parties who are consistently minimized by both the major political parties and the mainstream media. In practice, most people identify with a political party based upon one or more specific beliefs or ideas promoted by "their" party. But in effect, both Democrats and Republicans are essentially the same political party with slightly different factions squabbling over power within the main body. On subjects which support the Imperial mindset and the Empire, such as endless war, government overreach, the police state, fractional reserve banking and the endless money creation of the Federal Reserve to name just a few, both parties are in near full agreement. All that said, and regardless of the reason why, because people do tend to segregate into (supposedly) like-minded tribes (instinctual herding one might say) it's instructive to understand how it all works so we may better understand how and why our thinking and perception is externally and internally manipulated. Only when we understand the external influences that exploit our mind can we begin to recognize how prior programming and distortion sets us up for additional mind management. If we can't see the problem, we have no desire or incentive to make personal changes, let along change our point of view of how the world works. We must see the suffocating narrative for what it truly is if we are to at least begin to break from the narrative. Setting aside our formative years, where most of our deep conditioning and pernicious programming is implanted, the process does not end once we are sprung from high school or college. In theory and in practice, it has only just begun. The key to maintaining an unthinking bias is to constantly reinforce it. Likewise, the key to manipulating and modifying our bias to suit the needs of the controlling class is to use the same devices. And these days that means the mainstream media in all its forms and functions, including traditional and alternative "news" outlets, television, streaming services, YouTube, Facebook, Twitter, blogs, newsletters etc. The information and charts presented here were first posted at Business Insider. They, in turn, were provided the charts by Crowdpac, who is described in the article as "a nonpartisan firm dedicated to political data analysis, used federal campaign-contribution records dating to 1980 to estimate where various officials and donors fall on the political spectrum." 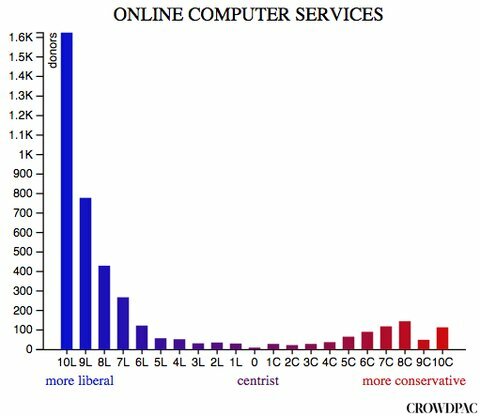 The article goes on to say "It (Crowdpac) scored individual donors as being more liberal or conservative based on which candidates they gave to". In other words, rather than use self-declared statements made by people about their political affiliation (we tend to be less than honest when speaking to others) Crowdpac sourced this info from where people actually put their donated money. Based upon the adage that money speaks louder than words, I suspect this info, if it was compiled and presented honestly, is quite valid while also admitting I have no idea of the methodology used or the number of samples taken. Let us begin by looking at the Newspaper and Print Media profession. 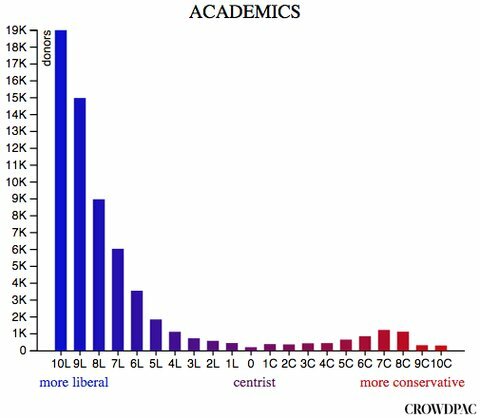 All the charts below "show the number of donors with each ideology score in each profession." 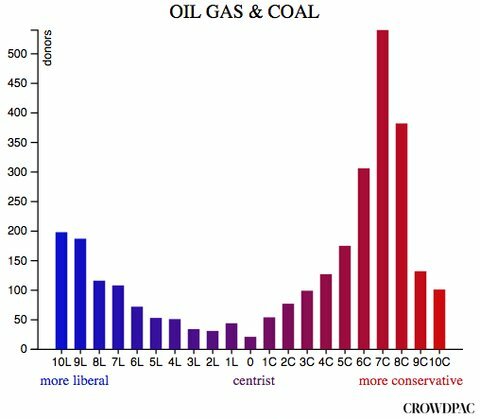 The bottom axis denotes extremes in ideology from 10L (more liberal) to 10C (more conservative), while the vertical axis/bars show how many people in that profession sample shared that slice of ideological bandwidth. The prevailing question I have when viewing such a lopsided chart as above is obvious, at least in my mind. 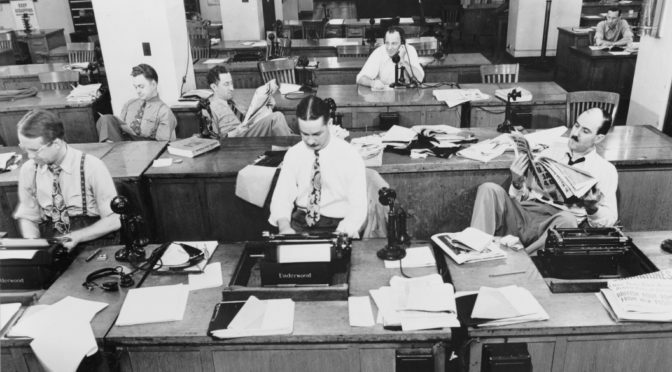 One of the foundational narratives indoctrinated into our minds from a very early age is how the "free press" is an open minded and impartial (meaning fair and honest in all its dealings) entity dedicated to rooting out corruption, malfeasance, illegality and dishonest dealings wherever they may lay. Knowing how difficult it can be for you and I to be fair and honest in all our dealings, both professionally and personally, especially when incentivized to do otherwise, how exactly does the Newspaper and Media profession do so when the individuals in that profession are so obviously slanted to one side ideologically? Remember, this is the primary source of nearly all news and information you and I consume. Do you think you are getting an unbiased and fairly presented point of view from this profession? I would ask the exact same question if it were dominated by extremely conservative ideology. The primary question is not what they are doing, but how is what they are doing influenced by their own personal biases and beliefs? So how about the Entertainment Industry? 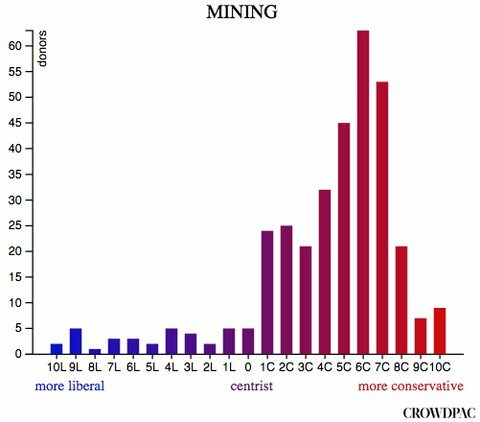 Where does it fall within the ideological spectrum? It appears to be nearly a carbon copy of the Newspaper and Media chart. So the same question applies....how can the Entertainment Industry be fair and unbiased in the production of their "product" when the individuals in that profession are so obviously slanted to one side ideologically? I'm not necessarily passing judgement on what they are doing or presenting. But I am asking how they can profess to be open minded, fair and honest and yet they overwhelming share a biased point of view. Nearly all of our entertainment choices now-a-days come from this industry. And it is widely understood and accepted in psychology and propaganda circles that entertainment can be, and often is, used to normalize points of view and belief systems as just the way things are. You know, natural and normal. What narrative are we being fed by these two industries? This is a reasonable and valid question we should all be asking ourselves if we truly wish to break from the narrative and begin thinking for ourselves. Obviously if this is not our wish or goal, then these charts will be used by us to mindlessly consume, confirm and affirm our latent bias. I'm not here to tell you what to think. Instead I am asking you to think critically rather than simply consume in the assumption if it was produced it must be good to eat. Next up are learning institutions, also known as Academics. Surely the textbooks and other learning instruments, along with the teachers and professors, are unbiased and designed to truly imbue our children with critical thinking skills and a clear-eyed view of the world? Hmm...maybe what we are told we are taught and what we are actually taught are not the same thing. I would be equally alarmed if that chart should an overwhelming conservative bias. To believe our children are receiving a "good" education when the bias, any bias, is that extreme is fantastical thinking at best. Clearly something is being left out of the stew during the prep and cooking of our children's minds. Remember earlier when I said "Setting aside our formative years, where most of our deep conditioning and pernicious programming is implanted...."? This ideological bent is controlling what our children "learn". Again, I'm not so much questioning what they are learning then I am stating no profession with that much embedded bias can possibly be presenting an open minded, fair and unbiased point of view. To think the profession can do so is to illustrate our own conditioned bias and programming. And I fully accept my readers may actually desire their children to be conditioned (sorry, taught is a more easily digestible word) in this manner. But children taught in this type of environment (whether extremely conservative or liberal) are not taught to think critically, but rather to simply repeat and regurgitate. Moving on, we are endlessly informed the technology giants, the Microsofts, Googles, Amazons, YouTubes, Facebooks, Twitters and so on, are unbiased stewards of their profession who simply wish to protect us from hateful thinking and speech. They don't want to control what we think or say, only to protect us from those who wish to corrupt our minds and shock our souls. Surely they must be unbiased and clear thinking, uncluttered by ideological beliefs and conditioning...right? Not so much. The above chart speaks louder than any words I could compose. The next chart wasn't really a surprise to me. Rarely do Mrs. Cog and I watch broadcast TV these days. So we are not exposed to the endless stream of commercials hawking this or that must have product or service. On those infrequent occasions when I drag the collapsible over-the-air TV antenna out of the basement and hook it up to the TV in the living room to watch something, what shocks us the most are the countless pharmaceutical ads for this or that miracle cure. Does anyone actually listen to the disclaimers that accompany the images of people smiling and laughing, hugging, holding hands, riding bicycles and driving cars, walking through golden fields of grain or some other utter nonsense? The (partial) list of possible side effects alone should compel people to question their sanity, let alone call their doctor and ask for the latest greatest miracle cure by name. And yet, during our admittedly very limited exposure to broadcast TV, easily one in five commercials are drug and pharmaceutical related. Considering the massive daily exposure average Jane and Joe, not to mention their children, receive, you would hope the industry wishes no harm to come to their "consumers". 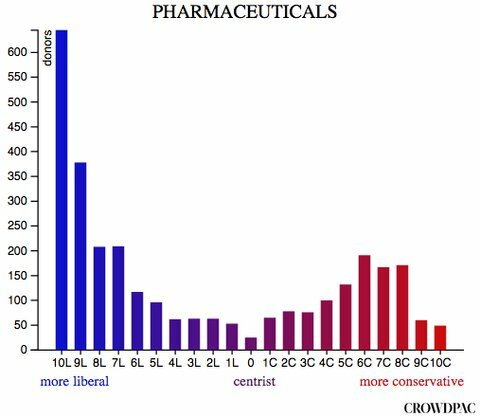 While not quite as off center as the prior charts, clearly the Pharma industry possesses a clear and present ideological slant. If the bias had been in the other direction, towards conservative points of view, I would ask the same questions. It's not so much the direction of bias as it is the bias itself. Based upon my own self-reflection, as well as decades of observing others, on average those who possess an extremely biased point of view are less likely to see, let alone compensate for, their own personal bias. This often, though not always, leads to biased actions that follow biased thought. As much as we want to believe those who are professionally trained can, and are, unbiased and open minded in their treatment of others, the reality does not mimic the belief. While there are always exceptions to the rule, the rule dominates in nearly all of our encounters and affairs when dealing with others. Again, I accept many are perfectly happy with the present state of affairs. And clearly this is not a new phenomenon, for this nation of 300 plus years has repeatedly cycled back and forth from one bias to another. I will warn, though, what was considered liberal or conservation 50 or 100 years ago is not the same today. So what about the legal profession, which includes lawyers, judges, police and so on? Let's take a look. This profession is a bit more evenly distributed, though still possessing a liberal slant. I'm not really surprised by this and suspect this mix has remained relatively constant through the decades for reasons I won't get into here. 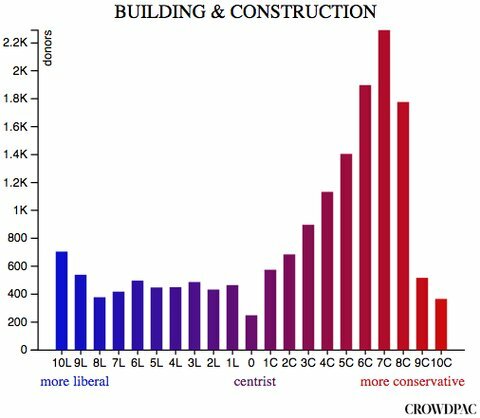 Before we look at some conservative professions, I wish to express one observation that immediately jumped out at me when I first saw this article and these charts. In general terms, the professions and industries which are most liberal are those that appear to be more creative in act and deed; they deal with concepts, ideas and beliefs and the realization of them. While their products and services can, and usually are, "real" physical objects, often their use and consumption are intellectual and emotional. While the written word of Newspaper and Print Media is "real", it is the message, or more accurately the narrative, which is conveyed. The same applies for the Entertainment Industry, Academia and Online Computer Services. And to a lesser extent, even Big Pharma, which, above all else, presents the narrative that if only we "consumed" their pills and drugs, we would be delivered from our distress, even illness caused by our own (in)actions. Legal promotes a similar narrative, one of deliverance from legal fear and distress. Essentially nothing in Legal is physically produced other than the bill for services rendered. To a great extent, in order to "consume" their products we must suspend disbelief and critical thinking and swallow whole and completely their product. In order to "consume" their product we must lay our mind and body into their hands for safekeeping, deliverance, health and jurisprudence. Now on to the industries and profession that are infused with another ideology, presently labeled as conservative. Let's start with Agriculture. 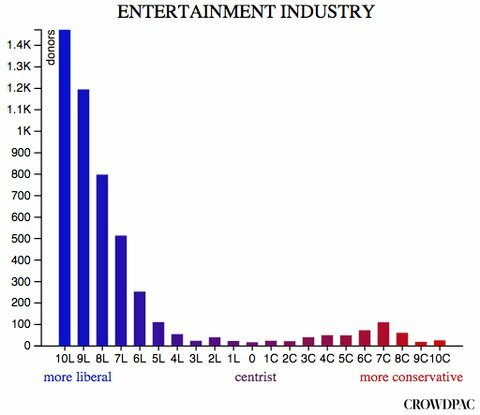 While not as lopsided nor extreme as media or entertainment, the ideology definitely is more conservative. Similarly, we find Building and Construction. 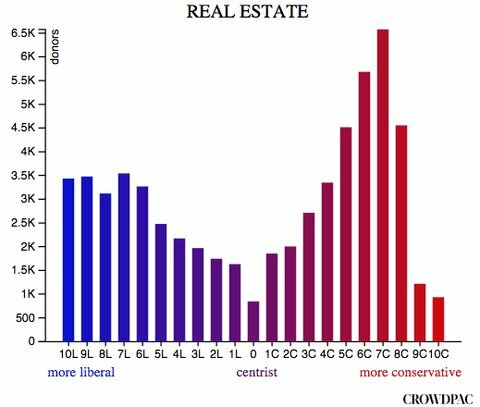 Even Real Estate leans more conservative, though less so. This makes sense because, as we are told by this very same profession, it's always a good time to purchase a home. Therefore, their political donations, and we presume their ideology, is less extreme. They wish to sell in all political environments, therefore it is in their best personal interest to avoid extremes. 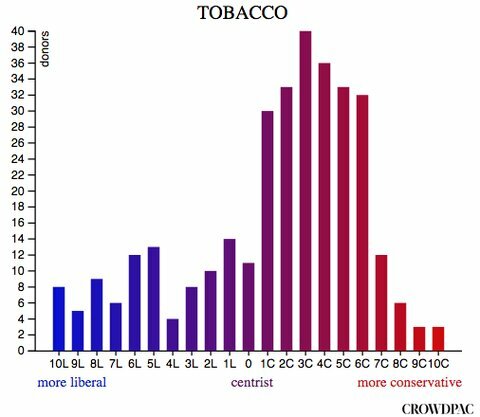 Keeping with my observation that professions and industries which are extremely liberal tend to produce intellectually and emotionally consumed products, the more conservative professions and industries tend to produce physically consumed products such as food, tobacco, minerals, hydrocarbons and real estate. This is the other side of the "what is real" spectrum. While I'm not exactly sure what this means, if anything, the divide is clear and wide and implies a fundamental difference in perception and belief. 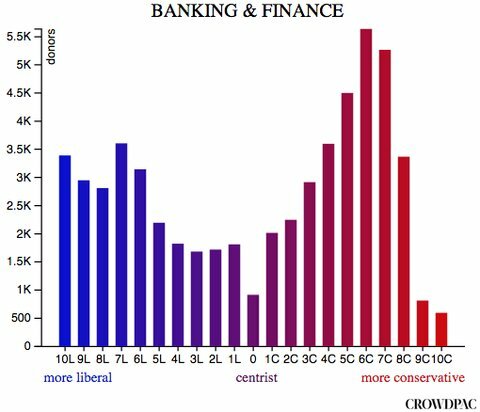 Banking and Finance follow the same pattern as Real Estate. Salesmen tend to just want to make the sale in any and all situations. It doesn't pay to possess extreme positions in any direction. Another observation is how the liberal professions are most heavily represented by those at the far extreme. The tallest blue bar, representing the greatest number of people in the sample, is all the way to the far left. 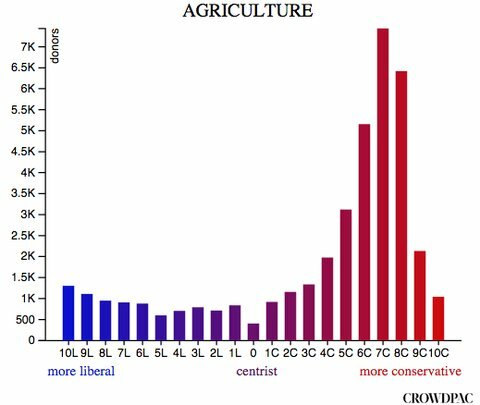 On the other hand, the tallest red bar, while certainly not in the centrist position, does not occupy the farthest right side and does not mirror the liberal extreme. Once again, for these conservative industries, being too extreme appears not to suit those who work in the profession. Finally let us look at three additional professions which appear very polarized, meaning plenty of red and blue and very little middle ground in between. 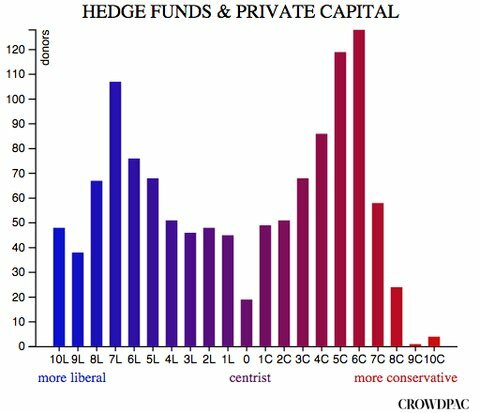 Hedge Funds and Private Capital appears to be almost evenly divided between opposing "sides". I suspect this has something to do with their client base and the herding instinct magnified by financial greed and fear. 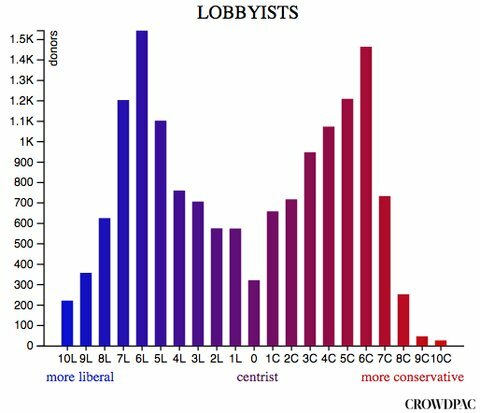 Not surprisingly Lobbyists are also polarized, though I suspect for the exact same reason as the Hedge Funds and Private Capital. Finally, we have Automotive Manufacturers and Dealers. 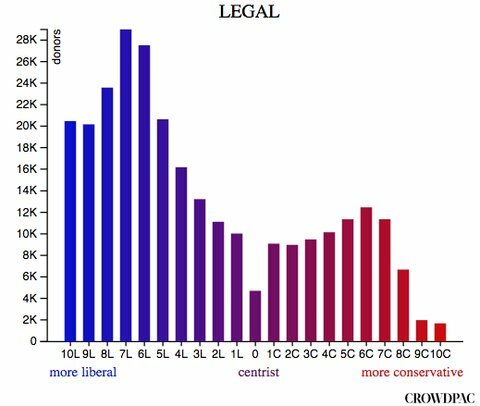 While quite polarized, the group still tends to lean somewhat liberal as well as more extremely liberal. I wish to add one more chart, then my closing remarks. The above chart illustrates an average weighting of ideology in each examined profession and industry. The four liberal professions most involved in the gathering, creation and presentation of narrative all contain average scores of 5.9L to 7.1L, while the two conservative professions most involved in creating physical things range from 3.5C to 4.1C. Based upon this information, the liberal professions occupy more extreme positions than their conservative counterparts. And while there appear to be many professions occupying the middle road, this is mostly an illusion created by averaging the professions. 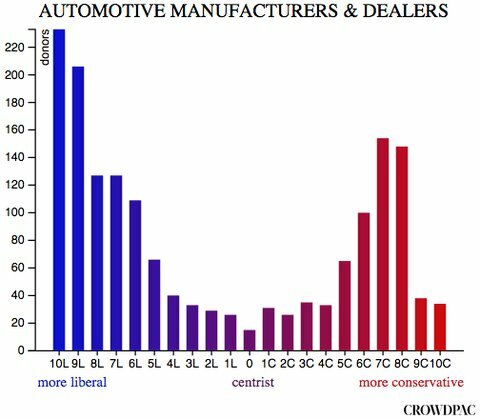 As I have shown via the charts, even the industries that appear purple in this last chart are actually highly polarized and not homogenized as the average number would imply. I have been very careful to avoid using the term 'radical' when describing either the liberal or conservative extreme. But those who establish and promote the narrative, mostly liberal professions and individuals, have no such reluctance and regularly do so when describing extreme conservative positions while at the same time justifying liberal extremism as just and "right". Once again, without passing judgement as to who is correct or not, carefully consider exactly what the liberal media is saying and why. There is an agenda on all sides, of this there is no doubt. But one ideology, more so than the other, has a direct line hardwired into our minds via mainstream media and entertainment narrative creation and promotion. When an ideology is trying this hard to speak and to be listened to, it is a wise person indeed who considers what they are not speaking about rather than just what they do. For there is far more to be learned from what is not spoken of than from what is.